I've always loved the thought of finding hidden treasure. When I was young, I dreamed of finding the proverbial treasure chest, complete with ancient gold coins and other booty. I could imagine the thrill of discovery as I brushed the dust of the years from the lid and slowly opened it to reveal its secrets. And over the past several decades I really have found some treasures. 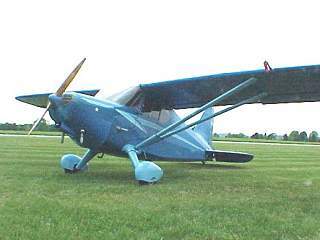 More than thirty years ago, I found the 1939 Piper J-3 that I still own, covered with dust and chicken dung and residing in a barn, where it had been placed almost twenty years before that. The wings were stacked beside it and it still wore the interesting and garish paint job that was the style in the late forties when it was last covered. The tires were the smooth tread type that I'd only seen in photographs and the turnbuckles were cord wrapped and shellacked in the old style. It was like opening a door to the past and I loved the feeling it gave me. A few weeks ago my old friend Mario called me. I love to get calls from Mario, since he's one of the few people in aircraft sales that can still make me feel like a kid. Mario has been selling airplanes since after the big war, and has probably sold more of them than anyone in the country. A few years ago he sold his aircraft dealership to his son Ron, but he still goes to work every day and is still selling airplanes. On this day he said he had heard of an antique Stinson that was going to be sold, due to failing health, by the World War II aviator that owned it, and he wondered if I might be interested. I assured him that I would be, and I asked him to find out more about it. A few days later he called to tell me that he'd inspected the airplane and that he was puzzled about just what it was. He said it was BIG and had been built in 1939 and had been expertly restored to original condition in 1993. It had flown only 35 hours since then and had been setting in the hangar since the late 90's. 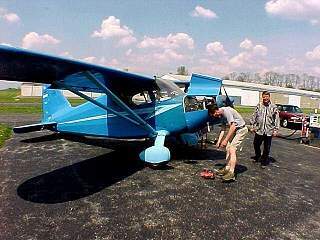 After several calls to Mario and some research, I found the sleeping giant to be a Stinson 105, also called an HW-75. Some 535 of these were built by the Stinson plant in Wayne, Michigan in 1939 and 1940 and they had been purchased by such celebrities as Edger Bergen and Jimmy Stewart. I had never seen one. Last Friday, accompanied by erstwhile mechanic Eric, I met Mario at the small airport in Ohio where the airplane slumbered. Eric, who had made my mechanical woes his own for a number of years, is the caliber of mechanic that you would want with you when planning a forced landing in the jungle. With Eric, everything has a solution and he calmly sets about finding it, applying it, then moving on to the next problem. Just the right person I thought, to breathe life into our dusty treasure. When the hangar doors rolled back and I saw the airplane in person, I noted the front of the airplane bore a resemblance to the 108 series which would follow. The wings had the familiar Stinson slots and flaps, and the shape of the fuselage favored the Voyager series. The tail however, carried the genes of the Vultee Corporation, which owned Stinson at the time. To me the empennage looked as if it had been grafted from a BT-13, which Vultee built by the thousands as a World War II trainer. The effect was to give the airplane a very 30's look, which was accentuated by the art deco treatment of the instrument panel. I loved it. The restoration had been lovingly done, and only the veneer of dust and dead insects that the years had deposited kept the airplane from being breathtaking. We busied ourselves, inflating the tires and servicing the brakes. The windshield was flushed with water and gently hand cleaned. After many years in the dim confines of the hangar, the Stinson was carefully pulled into the May sunshine and across the ramp to the fuel pumps. Fresh fuel was pumped into the two wing tanks and the system thoroughly flushed. With Eric swinging the wooden propeller the A-75 Continental awoke after a few pulls, as if it had last flown the day before. It sounded sweet and smooth and brought back to me many memories of flying behind such engines. After warming the engine and running it up for a mag check, I shut it down and Eric and I poured over the airplane, checking the items that would need to be inspected before the ferry flight. In the sunlight, it was apparent that the restoration was a complete one. The inside of the airplane had the look of an almost new ship. It had also been done with an eye to authenticity, with the fabrics and paints used being as close to the original as possible. Finally with the inspection complete and signed for, it was time to go. I buckled in for the 30-mile flight to Eric's home field, where the Stinson would receive an annual inspection and a though clean up. Once again the engine was started and warmed. I slowly taxied to the end of the runway. After a last check of the systems, I aligned myself with the runway and slowly pushed the throttle open. All seventy-five horses shook themselves awake and started noisily pulling me toward the departure end of the 1900 foot runway. Steering was straight and true and after a moment I lifted the tail at what I thought was the right time. The airspeed indicator came alive and as the hand touched 60 miles per hour I gingerly applied backpressure. I felt the gear come off the runway, then gently settle back and roll a few feet farther. After a short pause, she gathered her skirts and the old Stinson and I were flying. I told Eric later, that I thought the day had been magic. It had it all; the sweet newness of an early May morning, the kinship of working a project with people you like, the taste of adventure that discovery brings, and the wonderful feeling that comes when something good had been done well.